I am a huge Fisher Price fan, I think that their items are well made, colourful, bright, sturdy and worth the money. They last for years and our Fisher Price toys are played with again and again. They are always top of our Christmas lists for under 5’s and the new Imaginex Range is a big hit for my bigger boys. I fondly remember playing with the record player and the phone as a child and it’s lovely to see them making a re-appearance. Ahh the memories. 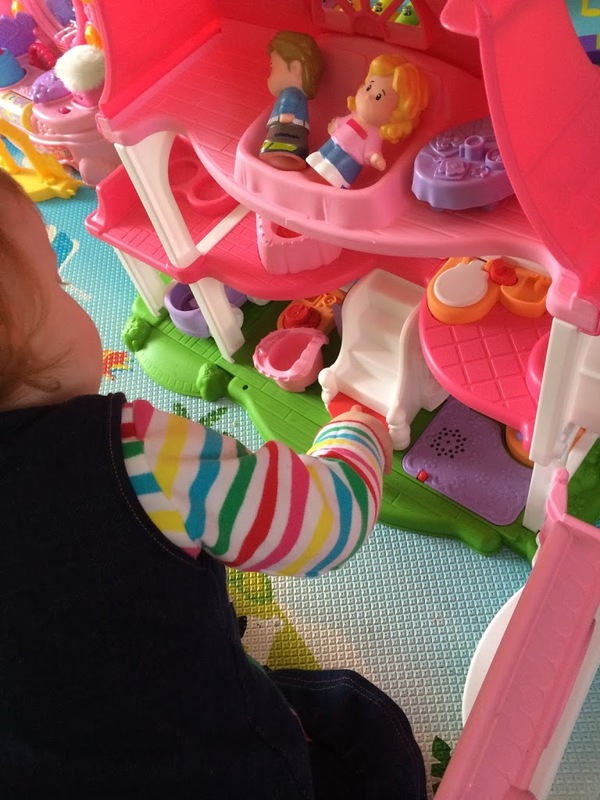 Recently Aria and I have been trying out the Fisher Price Little People Happy Sounds Home. This is a great addition to the Little People Range. We got Aria the Little People Disney Princess Castle at Christmas and she loves it. Ok I love it too. The Happy Sounds House looks great and is very company. In the set you get the house which requires a little bit of set-up with a screwdriver, but nothing major. It’s just a case of putting the front of the house on and the front door. All stickers and other parts are already there, so no worries about sticking them on squint or anything. Once set-up there is a car for the Little People to ride around it, with it’s own little parking spot at the side of the house. In attic area it’s a perfect spot for the mummy and daddy bed, allowing them some peace and quiet away from the sounds of their home. The second level has a toilet, which I thought was fun, the lid lifts up and there is a little button to the side which makes sounds and plays tunes. A little clock style dial is in the middle giving them impression of day and night. There is a cute little bed for the baby, which again makes some delightful noises. A little balcony for some evening entertainment and the main focus is the stairs. The bottom step plays funky little songs to get your little one dancing and singing and driving you nuts after it’s been pressed a million times an hour. Honestly, it’s great. The kitchen has some sounds too and an open and close front door will keep them entertained and playing peek a boo. 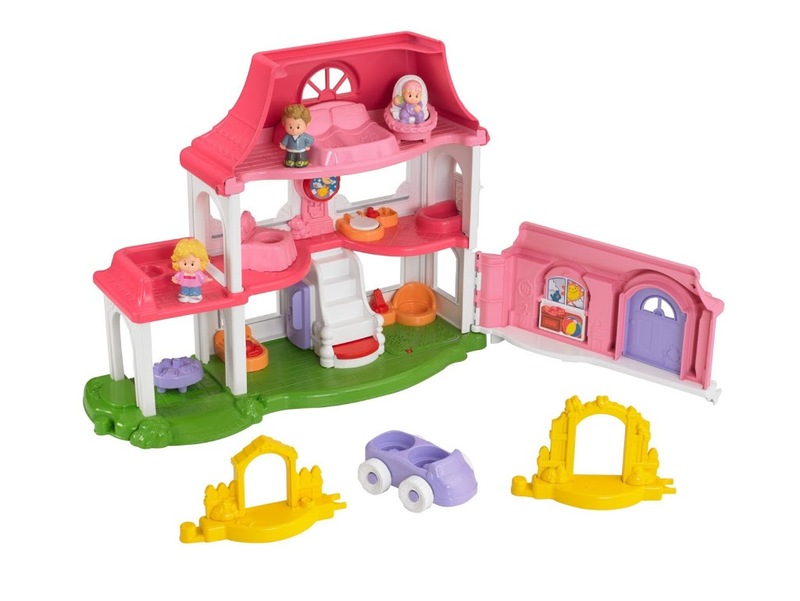 The set comes with a mummy, daddy and baby people, a table, chair, car, two joining sections and the house. The joining sections allow you to add to the set with other items in the range. One of the great things about the Happy Sounds Home is the height, it means your little one can sit down and play or stand up and still be able to reach the upper levels with ease. There are 12 fun songs which are in 5 different styles in the happy home. Aria has been playing with this every day, she’s loving putting the baby to bed and driving the car about. 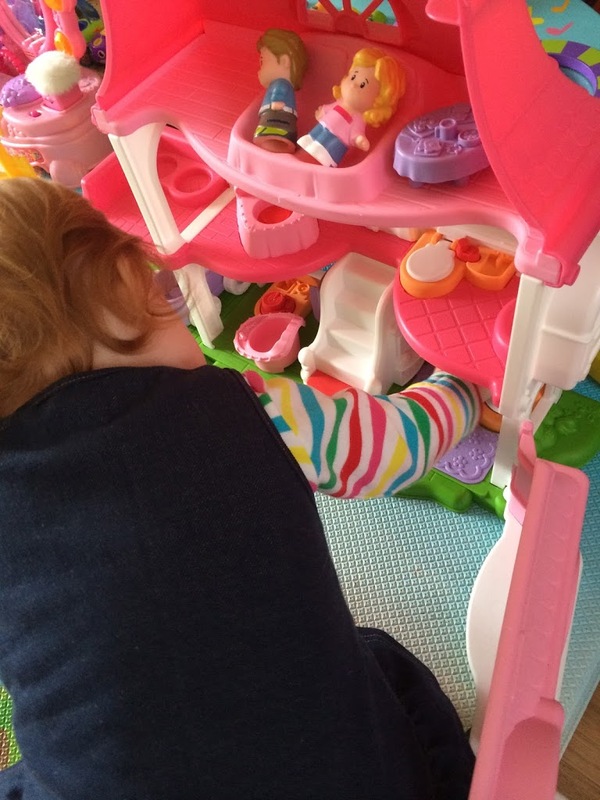 She’s not quite into imaginative play yet as she’s only 18 months, but she’s getting there and having lots of fun. I’ve been playing with her and so have her brothers. It’s sweet to see them all interacting through the characters. The buttons are easy to get to, simple to press and the sound quality it excellent. One the the good things about it is that at the end of the day, everything packs away inside and you close the front of the house for easy storage. I really do love this toy. 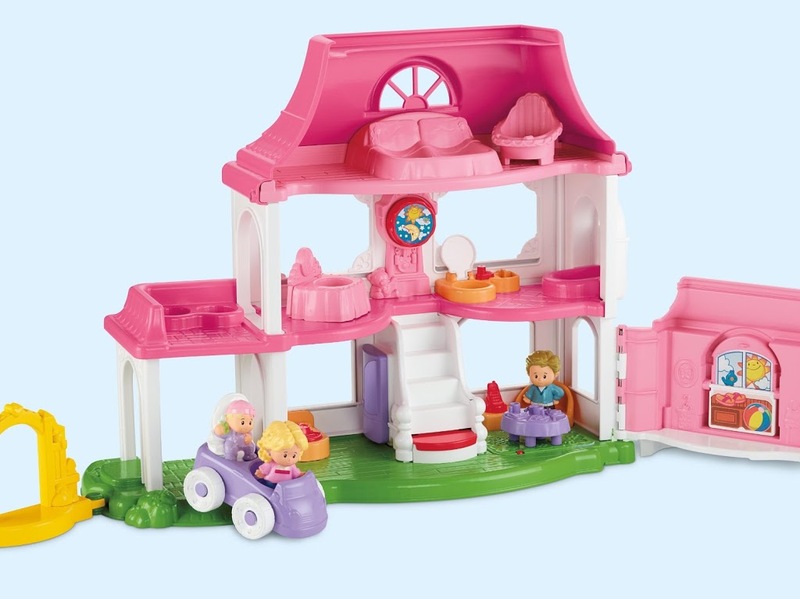 The Fisher Price Little People Happy Sounds Home can be purchased from Toys R Us and is suitable for children aged 1-5.